Building from a Strong Foundation to Digital Action! Effective marketing starts with a solid foundation. This begins with Branding as the foundational layer. From there, content needs to be developed to tell your story through words, images, photos, and videos. Once these are in place, you should develop your marketing collateral (ie: corporate stationery, promotional pieces) which you’ll need in the real (offline) world. Next up; it’s time to take the plunge into the online space where you’ll focus your energies across Web, Social and Search. 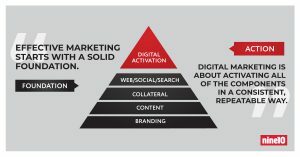 Once all of this is in place, you’re ready to take the next step – ACTIVATION – shown in red in on the marketing pyramid. Digital Marketing is about activating all of the foundational components on the bottom of the pyramid in a consistent, repeatable, and measurable way. Join Ryan Blais of nine10 Marketing (www.nine10.ca) for a series of sessions where you’ll unpack the layers of the marketing pyramid. Following this process, you’ll be able to move from a Brand Foundation through to Digital Activation.